This classic family holiday treat was passed on to me from my mother. TRaditionally served on one platter shaped like a ring, we decided to make individual servings so are using decorative cupcake liners. 2. In a large mixing bowl, combine the flour, baking powder and salt. 3. Add the egg mixture to the flour mixture and mix. 4. Place the dough onto a lightly floured board and knead until smooth, add more flour if needed. 5. Shape the dough into a ball, cover with an over turned bowl, and let rest for 30 minutes. 6. Cut the dough into 1/2 inch slices. Roll each slice between your palms into a 1/2 inch thick rope and cut the rope into 1/4 inch nuggets. If the dough feels sticky, use a tiny bit of flour to dust the board or your hands. 7. Pour about 1 inch of oil into a wide heavy saucepan or a deep fryer. Heat the oil to 370F or until a small bit of dough dropped into the oil sizzles, swims rapidly around the pan, and turns golden brown. Slip just enough struffoli into the pan to fit without crowding. 8. Fry, stirring once or twice with a slotted spoon, until crisp and evenly golden brown, 1 or 2 minutes. Remove with slotted spoon and drain on paper towels. Continue with the remaining dough. 9. 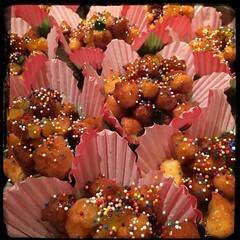 When the struffoli are all fried, gently heat the honey just to simmer in a large saucepan. Remove from the heat. 10. Mix the citron (orange peel and lemon peel) candied cherries, almonds to the stuffoli. 11. Fold the honey into the stuffoli.